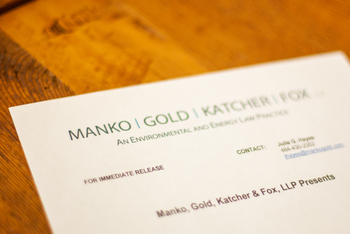 Manko, Gold, Katcher & Fox, LLP (MGKF), an environmental, energy, land use law and litigation firm based just outside of Philadelphia, PA, is pleased to announce that William Hitchcock has joined the firm as a new technical consultant. He rounds out a team of 29 attorneys, two other technical consultants and three paralegals. With more than eight years of experience in the chemical manufacturing sector and degrees in both Chemistry and Environmental Engineering, Hitchcock has a diverse skill set that will aid in advising clients on complex technical and regulatory issues. Additionally, his experience with corporate environmental, health, safety, and sustainability programs gives him the ability to suggest practical and cost-effective solutions to meet the challenges facing today’s businesses.